Elegant details with larger, center kitchen. This townhouse will capture your interests. 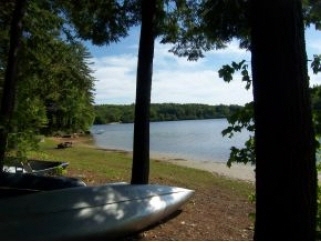 Collins Landing is a convenient, quiet community surrounded by 145 acres of conserved lands and located on the shore of Lake Horace. The townhouse association offers you more time for biking, kayaking and less time on lawn care. Two bedrooms, 2 baths, front and back decks. Short walk to your association beach. The development is FHA, VA and USDA approved.